Who doesn't love a blog giveaway?? Well, I've always wanted to do one but never have, so I'm going to try to make this a good one! First of all, there are TWO prizes up for grabs! But I'll get to the prizes in a minute... first, I want to share a card! The flowers + fence panel here was inspired by this lovely card from Laurie. Along with Botanical Silhouettes, I used the new Beautiful Blessings, and the picket fence die. Of course, there's a little Tiny Tag on there, I love those little tags as a sweet finishing touch on so many cards, and I really loved Laurie's idea of tying the tag to the fence! The fence was cut from kraft cardstock, and then I ran it through the woodgrain impression plate which was inked, letter-press style, with Versamark ink. It gives just that little extra little bit of oomph to the impression to add a little more texture. Like I said above, I managed to earn some extra PTI Anniversary sets, so I knew that I wanted to do a blog giveaway for one of my extra sets! 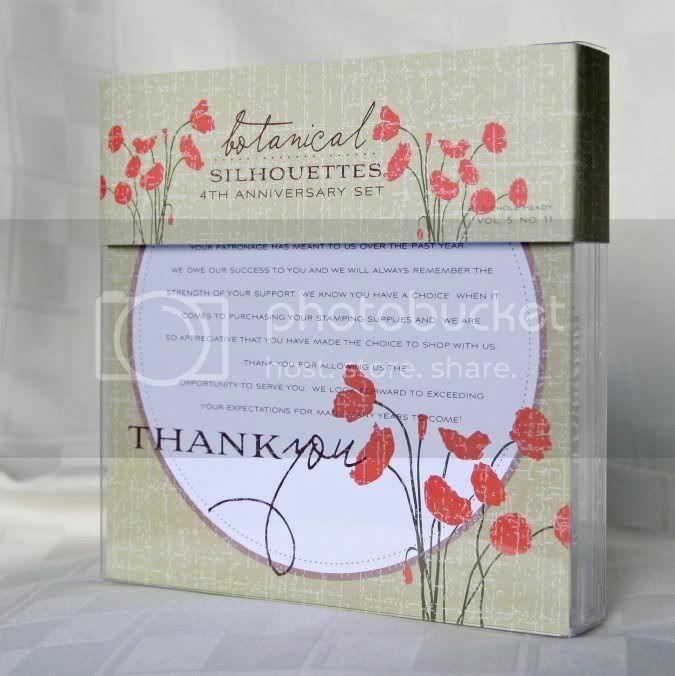 So here is Prize #1: Botanical Silhouettes! You can see the whole set, and also the amazing inspiration from the PTI Design Team in the gallery, here. And for even more amazing projects, check out Nichole Heady's work with the set on her blog, here. BUT WAIT.... I know that many of my blog visitors are my fellow PTI-obsessed stampers who have already earned their own anniversary set (or two... or... more ;) and I don't want to leave you all out! So I'm going to also give away a 2nd prize to a separate winner, this fun and colorful 6x6 Echo Park paper pad, perfect for the summer days ahead! And in both cases, I may have a few other little surprise embellishments and goodies to include as well! DEADLINE TO ENTER: 11:59pm Eastern Time, Saturday June 25. I will post the winner on my blog by noon on Monday June 27. Good luck, and thanks for visiting my blog! Debbie, your work is so perfect. I don't know how you do it, but you do it so well! I love the giveaway idea tho! I think it's a great idea and makes it fun for you and your readers. Debbie, I always admire your style not only on the cards but the layouts and this one is no exception! The fence is a "stand out" on this card, perfect! To tell you the truth I had never even visiting Papertrey Ink before. My goodness! I have it bookmarked and while browse some more with a different cup of coffee (! ), but the set that caught my eye today was the Masculine Motives. What a beautiful card, Debbie! I love the tiny tag on the fence! I do have an anniversary set already. Thanks for the chance at your sweet giveaway! Your card is so creative Debbie. I love the watercolor look that you gave the flowers.And your impressed/versamarked fence rocks! Topping it off with that adorable tiny tag was perfect. I do indeed already have the anniversary set, but even if I do win, I'd love for the prize to be given to someone in need of some crafty goodness...perhaps someone who lost everything in the tornadoes down south? What a cute card! I love the added touch of the picket fence! I did not earn an anniversary set last year....I'm hoping to get one though! Thank you for offering the blog giveaway. I am fairly new to PTI and did not have the opportunity to earn the anniversary stamp set. My favorite set is Mat Stack IV. I am in awe of the quality of PTI stamps, the design team and I work of the many PTI followers. Again, thanks! What a beautiful card, Debbie! I love how you Versamarked the fence with the impression plate. I need to remember that tip when I finally start getting IPs. I am a PTI newbie (just made and received my first order about 6 weeks ago) so I don't have the anniversary set and the more I see of it, the more I love it. My favorite PTI stamp set, that will be in my next order, is Friends 'Til the End -- love those big flowers!! What a beautiful card! Thanks for the chance to win! My fave set is Mazel Tov (and additions). Great versatility and just gorgeous! Congratulations and thank you! What an awesome prize! Up, Up and Away....it is the one I use the most. I love them all! ;) I did get the anniversary stamps and they are outstanding! I buy a lot of the dies as well...they are excellent! I love you work, you're blog is one of my regularly scheduled stops...daily! Debbie, what a great prize! I love that anniversary set and have been using mine with the picket fence too! Some girl is going to feel very lucky to win that. I love your other prize even more! No one around here carries the small echo park pads. I love ep! Your card is gorgeous, thanks for the opportunity to win. Debbie, thanks for the chance to win something, who doesn't like to win a prize? Your card is adorable and a great idea to letterpress the picket fence. My favorite stamp set currently is button boutique. I have used it a lot lately. I did get the anniversary set, but would love to win that cute paper pack! How generous! I don't think I earned a set this year :( This would be so much fun. Debbie your card is amazing! I love the colors and the patterned paper you used! I also love the scripture you stamped and that little bee! Sooo cute! Thanks so much for the shout out! I appreciate it! (dont worry about me for your giveaway! I already have this super fun set!) i just had to stop in n say hi! What a beautiful card. Such a well made cade with such loving reverance. Very special indeed. I have yet to use my anniversary set. bit scared I won't do it justice. May have to work up to it, especially seeing what amazing possibilities there are as clearly demonstrated in your glorious card. Not sure which is my favorite set. Maybe it's Mega Mixed Messages. It seems to be my go to sentiment set most days. As for images, I love Button Boutique for sure. I seem to have work hard at not using it on each card I make! What a hoot! Hi Debbie! I just found your blog, hurray. I am new to PTI product and I checked it out. Wow, those are cool stamps! The Turning a New Leaf set caught my eye, it looks very useful. I don't have any of their stamp sets so I'd love one if I'm luck enough to be a winner. Awesome card Debbie! I adore how you paired the set with the fence die! My favorite PTI set? That is terribly difficult to say I love so many but I do turn to my Beautiful Blooms set quite a bit! Thanks for the chance to win! My favorite PTI set is In Bloom (among others). I did earn an anniversary set, but I'd love to win one to give to a craft friend here in town. Hi Debbie! What a pretty card! I love the pattern paper used as well as the beautiful stamped flowers! Thanks for the chance at the anniversary set but I have my own. Now that paper would be fun to win! Debbie--no need to enter me in the drawings, I have the anniversary set *and* the paper, LOL! I just wanted to say that I love your card! The warm flowers and picket fence with the tag are lovely! And your idea to combine it with the Beautiful Blessings sentiment is one I will remember! I must say it is the first button bits set they came out with. I love being able to use the buttons with my stamp set. I don't have the anniversary set. I love your blog, have followed your work since your TSR days, I love your cards, but miss your layouts! What a great card! Thanks for the chance to win. I *thought* I ordered enough to get an anniversary set; but it appears I might have been o n e short! Dang. I'd love to win it - looks like a beautiful set. Beautiful! I love the layout; the way the mat stack peeks out is great. And the flowers are so pretty. I've only just discovered your site, and after scrolling around a bit I decided I HAVE to join in on the fun of this blog! (I usually avoid such things. :0) I have only used one of the PTI stamp sets, the Background Basics: Twinkle which I love for creating textured backgrounds AND boarders. I'm really enjoying perusing your sample cards. so so beautiful - fun and unique. "I think this is the beginning of a beautiful relationship" as the saying goes. Oh, how fun! Your first give-away :) My absolute favorite set has become the Tiny Tags set. I could tie tags on everything! They're so cute and can be used on just about every card :) Thanks for a chance to win (and I have also earned the Anniversary set). I love your work Debbie, and I especially love this card. One of my favorite set of PTI stamps is the Friendship Jar. (I do not own the Anniversary Set). Thanks for the chance to win! Your work is always so beautiful and cheerful and this card is no exception! I love the botanical silhouettes paired with the fence. Very cool card! My favorite PTI set is Big & Bold Wishes. I'm glad you are having this giveaway because I gives me the opportunity to check out your blog and beautiful cards. My favorite set is Little Bitty Bird because it is so cute and only cost $15. A close second is Mazel Tov, because it is one of the few Jewish sets around and it just about covers everything. I already have botanical silhouettes, but would love to enter the contest for the paper. I love your card! I was able to get a set of Botanical Silhouettes, so I'm just here to tell you how much I like the way you used them. :-) The picket fence is jusst adorable!.. Hard picking one favorite set from PTI. I really love my Blooming Button Bits, cause I love buttons. Love Vintage Picnic too, just ordered the Die! Wow, thank you so much for the chance to win one of these fabulous candies!! I saw your post on the PTI forum. My current favorite PTI set that I own is Big Birthday Wishes. I love how it coordinates with the numbers dies. I didn't earn and anniversary set last year, but would love the chance to own it. Wow! What a fabulous card! so lovely and colorful!!! Thanks so much for the opportunity to win :-) Saw your post in the PTI forum... the PTI set i really want is the jars and fillers--- my only hesitation is that i KNOW i wont be able to just buy one - i have to have them ALL!!! My favorite PTI set that I own so far would have to be Tiny Treats: Valentine. I just love those cute little images with the little hearts! What a great giveaway! I am a new PTI lover but did manage to snag an anniversary set but would love to use the fab patterned paper set ... thanks for the chance to win! So generous, you are! Yay! Deb - a great card and a great give-away! I just tried to use that die tonight and it wasn't working for me, so I walked away and here I am at the computer. I may have to case your card just so I can use that die. My favorite set...wow - that's tough. My favorite set TODAY is Springtime Doodles. Tomorrow it may be different. I already have the Anniversary set, but not that awesome Echo Park paper - love their paper!! My favorite PTI set is, Tiny Treats Valentine. I think. I really want the little lemon in it. (I don't own the set yet!) It's high on my wish list! I already have a PTI anniversary set of my very own, but that paper pad is so adorable, too! I would love the anniversary set... and actually whatever you are giving away is great with me! I just found your blog from the PTI forum. That card is so pretty. I'll probably CASE it. Love that picket fence die. My favorite set is Flutter By Friend. I already have an anniversary set, but I'd love to win that paper. Thank you for giving us all a chance to win great prizes. I love this anniversary set and it would be my favorite. I do not own it. Your work is amazing!!! Love the picket fence!!! Hey Debbie! Katy (FloridaMomOf2 on the forums). Not sure how I hadn't seen your blog before this, but I am officially a follwer now! :) You make such beautiful things! And how sweet of you to do a giveaway. To answer your question.. My favorite set would have to be Damask Designs. And now I am going to hit submit before I spend three hours deciding if that REALLY is my favorite.. Hahaha! :) Have a great rest of the week!! Good thing you told us about it again!! I didn't sign up for your giveaway yet, because I thought I would receive the set myself and then I would let the chance to other followers, but now I found out that I won't get the set, 'cause the count is up to February and I made the required number of sets only in March... Sooo... Would love to also have the chance to win it, because it's gorgeous!! Your flowers look so pretty! Like you watercolored them yourself!! My favorite Papertrey set.. hmmm... well I have more, but if I'd have to pick one, it would be Beautiful Blooms II Loooove those flowers!! And Love Lives Here and Itty Bitty Bird are close second and third, hi hi. Wishing you a lovely day, hopefully not as rainy as with us!! Love the card ..now I regret I didn't order the fence. My fav. PTI set it is a difficult one so many are my fav.maybe Vintage Picnic? Love your giveaway the PTI set..thanks for a chance to win. Deb, your card is beautiful. Love the layout, embossed fence with tag with the gorgeous flowers behind it. Your sentiment ties it all together so well. My favorite set now is Round & Round because it's the first one I bought off the Forum (I'm a newbie). My long wish list changes daily. Already purchased the anniversary set(should have waited to maybe win one) but would love the Echo Park paper. Added your blog to GR. Thanks for the chance to win your blog giveaway! Your card is really pretty! I like the different colors of flowers you used! Your card is beautiful. I am loving the anniversary set and the picket fence die is a perfect match. Love the letterpress effect on the fence. Makes it look so realistic. It's so sweet of you to give out blog prizes! My favorite PTI set is Giga Guide Lines set. I love the sentiments on it and find that it makes great backgrounds. Thanks for the chance to win. Thanks for the opportunity to win! Your card is so pretty; love the picket fence with the flowers. I already have the anniversary set but the patterned paper is beautiful! My favorite PTI set has to be ALL of the Year of Flowers series. I love them and pull them out all the time :) I can't wait to get the set with all of the smaller Year of Flowers stamps.